WP Ticket offers powerful tools and options to make it better fit to your needs. Using WP Ticket setting pages, you can make customizations without changing theme files or writing additional code. Enable or disable any field, taxonomy or relationship from backend and/or frontend including frontend support ticket entry and search forms. Limit access to frontend support ticket entry and search forms to logged-in users only or open them to everyone. Display login and/registration on demand. 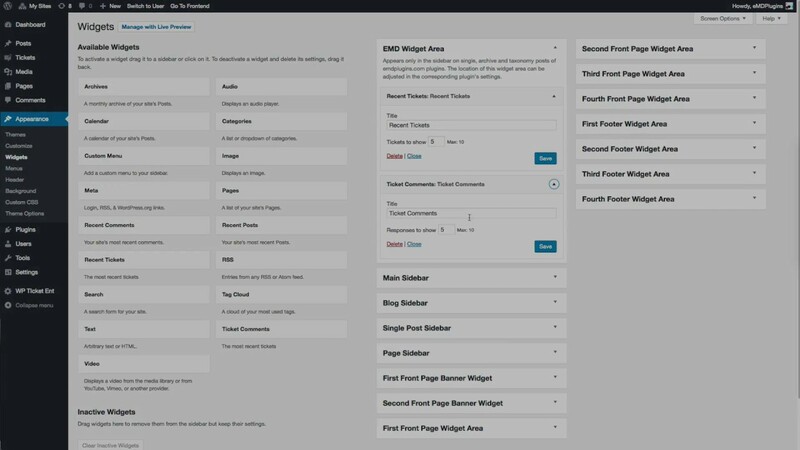 Set plugin page templates to sidebar on left, sidebar on right or full-width without modifying your theme's template files. Set the base slug for tickets, agents, priorities, SLAs, topics, statuses and tags. Enable/disable page navigation in archive/taxonomy pages.